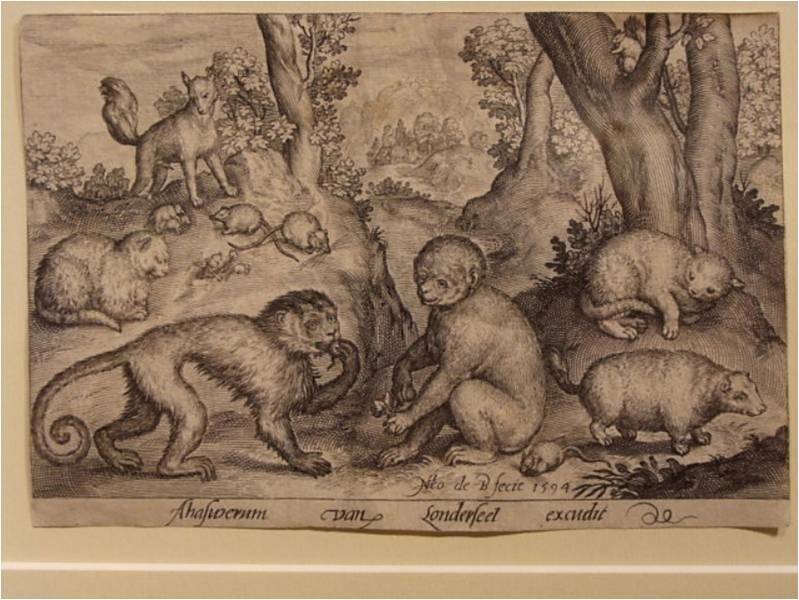 This engraving depicts several animals which, in the Renaissance, were associated with sin, vice, and evil. For example, the two monkeys in the foreground seem to mimic Adam and Eve’s role in the fall of man, apple and all. Other animals in the print associated with evil include two cats, mice, two rats, and a fox. In general, using animals to represent the vices of humanity was not uncommon in the arts during the Renaissance. Animals frequently and easily seen in northern Europe, such as the fox and cats, are depicted here naturalistically while the more exotic monkeys seem more generalized. The depiction of some of the more puzzling creatures, such as the unidentified opossum-like animal in the lower right corner, may be based more on verbal descriptions or hearsay. 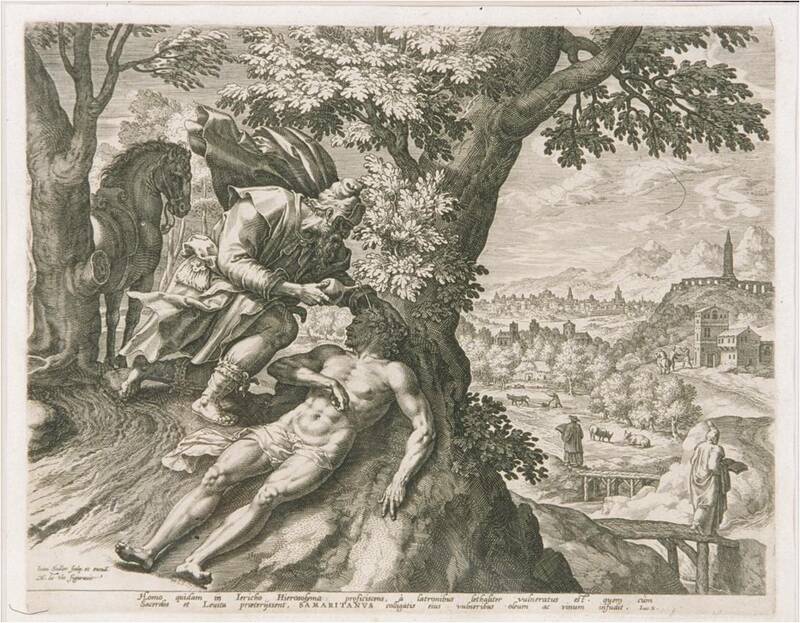 The inscriptions at the bottom of the print attribute the print’s design to Nicolaes de Bruyn and the actual act of printing the engraved copper plate to Ahasuerus van Londerseel. 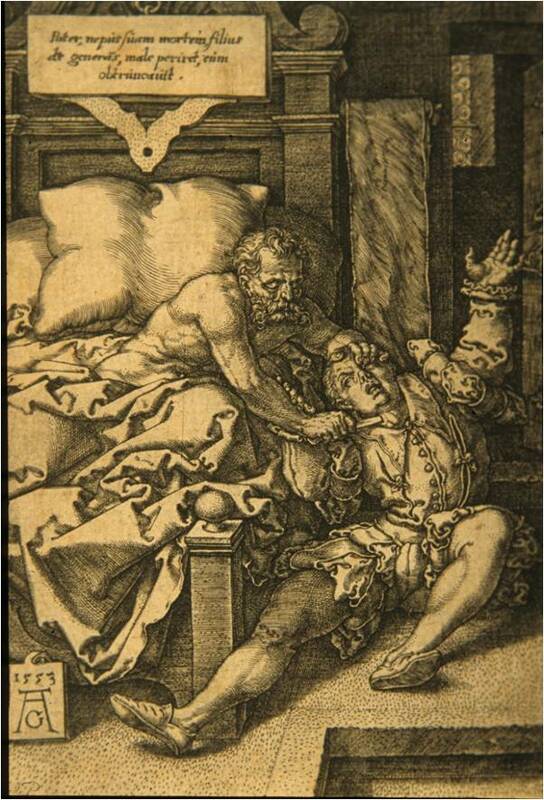 This engraving by Heinrich Aldegrever depicts the legend of Herkinbald, a righteous man who (while on his deathbed) murdered his nephew by cutting his throat because the nephew had violated a woman. This legend is significant to the Christian tradition: his bishop denied Herkinbald the last sacrament of Holy Communion after he refused to confess the murder of his nephew. However, Herkinbald miraculously then received the sacramental bread directly on his tongue before dying, signifying that the justness of his nephew’s killing was acknowledged by God. It is possible that Protestant viewers in northern Europe at this time would have seen themselves in the role of Herkinbald believing their break from the Church in Rome would likewise be deemed righteous by God. 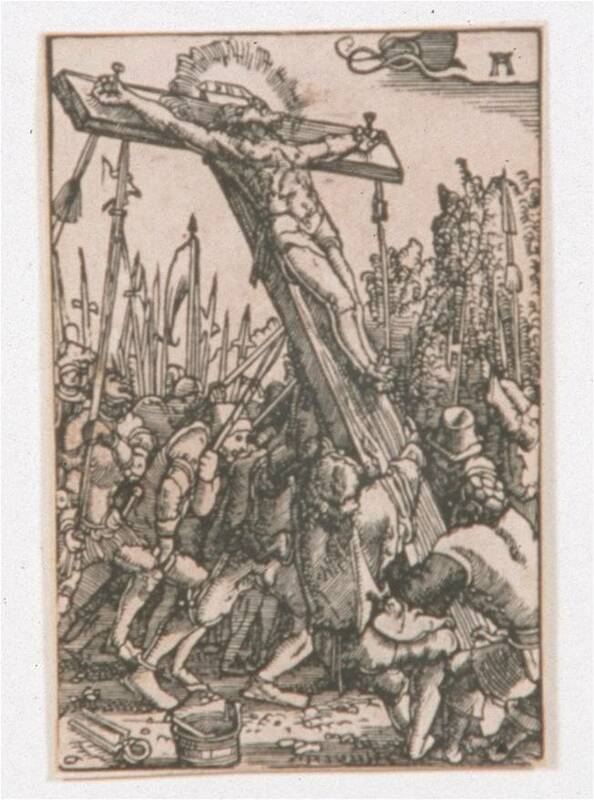 This tiny woodcut either printed as a single leaf this size or cut from a larger work, shows the dramatic scene of the raising of the cross to which Christ’s body has been nailed. 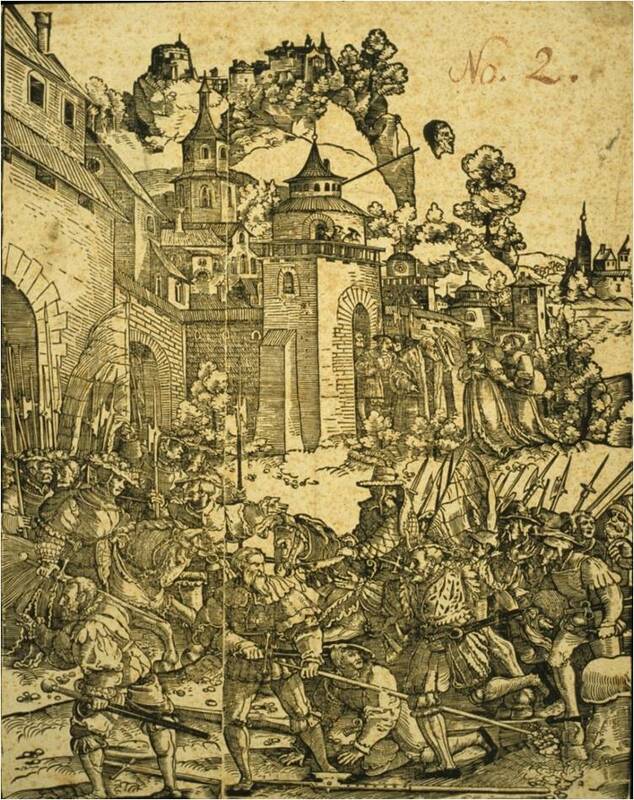 In a few concise woodcut lines Altdorfer creates in the cross a dynamic diagonal line across the composition and echoes it with smaller lines stressing the effort involved in the elevation. Although Altdorfer is most well known for his contributions to landscape painting, he also worked as an architect and town councilor in his home city of Regensburg in present-day Germany. He saw success in all of those endeavors, particularly in running a large and prosperous workshop. This sheet, one page cut from a once-complete book, shows the innovation of early printmakers. Here, they have adapted a centuries-old form—the Book of Hours, a staple of the handwritten and illustrated (manuscript) tradition—to new printing techniques. Books of Hours had long served as personal, devotional volumes. Their small size helped them to be portable and intimate. Often lavishly decorated, they included daily prayers, notes of major feast and saint’s days, calendar pages, and other information to help the devout navigate their daily religious life. This calendar page, which also includes some color and gilding, applied by hand, notes that April has thirty days, and records the feast days for saints including Bishop Rupert, Mary of Egypt, and Dorothy. An early sixteenth-century manuscript version of a Book of Hours can be seen by visiting Special Collections in Pickler Memorial Library just across the Quad. This woodblock print by Hans Burgkmair (court artist of the German Holy Roman Emperor Maxmilian I) is an illustration for Marx Treitzsaurwein’s book, Der Weißkunig (The White King). This book, part of a trilogy, was said to have been dictated to Treitzsaurwein by Emperor Maxmilian I himself in the sixteenth century. In this narrative, Maximilian is personified as the White King. 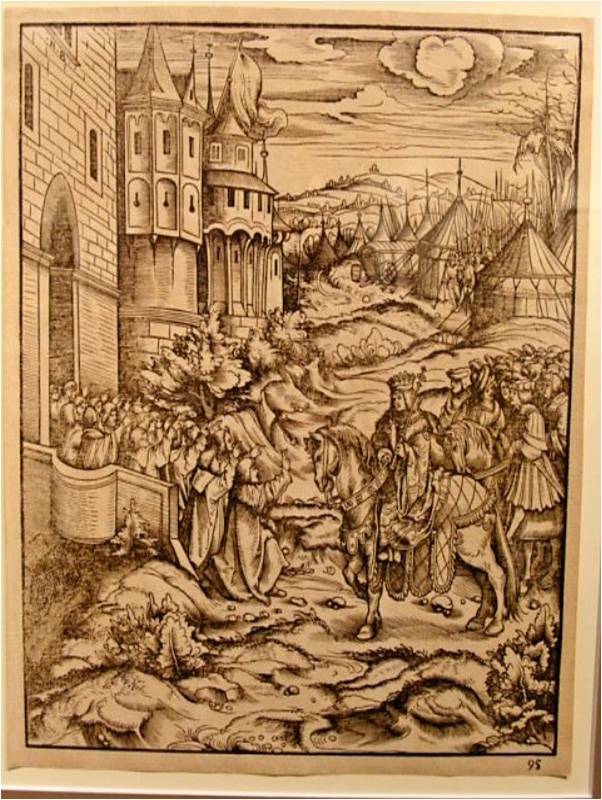 This particular illustration showing the Emperor approaching the entrance of a medieval city comes from the third part of the series which chronicles the reign of Emperor Maximilian I. Although Burgkmair was chief designer for about half the prints in the book, three other artists also created images for it. 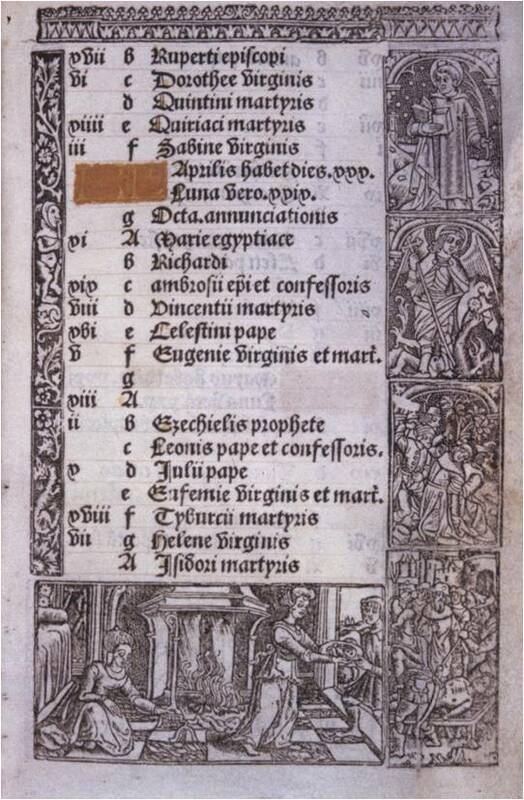 Burgkmair also worked closely with the block cutter and publisher Jost de Negker (c. 1485 – 1544, Flemish) although his involvement in this particular image is not certain. More than other works, this print has presented mysteries for the curators of this exhibition. The print came to us with only the name “Lucas Cranach” and no information about the subject matter. Even the artist’s name, though, is unclear as there are two artists by that same name: Lucas Cranach the Elder, or his son, Lucas Cranach the Younger. 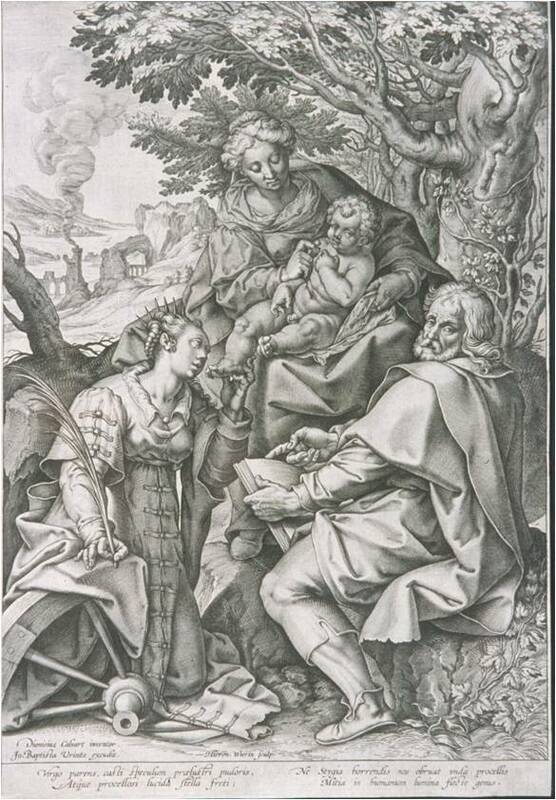 To solve the puzzle of authorship, the curatorial assistant compared this print with other works by both Cranach the Elder and his son, a process known as attribution; those findings are explored in more depth in the bound volume of research available in the gallery. To complicate matters, the meaning of the story of the military processions depicted is also unknown. The enigmatic severed head that flies across the scene in the upper right corner has also fascinated and confounded the curators. A later collector, possibly in the eighteenth or nineteenth century probably added the “No. 2” notation written in the upper right corner of the print in faded ink, though it is likely to have been written in later years. "The Virgin Mary, St. Catherine of Alexandria, and the Christ Child"
This work provides the one partially Italian contribution to this largely German and Flemish exhibition. The association of Hieronymus and his printmaker brothers with Jesuits, as well as Calvaert’s residence in Italy (where he was known as Il Fiammingo for his Flemish origins) partly explain the more Catholic emphasis on a saint in this collaborative work of art. This engraving depicts St. Catherine of Alexandria seated on the left, the infant Christ on the lap of the Virgin, and a male figure, likely Joseph, seated on the right. St. Catherine, an Alexandrian of royal decent (from an area in present-day Egypt), was canonized for spreading Christianity and resisting the advances of the Emperor who then ordered her death, making her a martyr. Here she is pictured with the spiked wheel (shown lying to the saint’s side) on which she was unsuccessfully killed, after an act of divine intervention that broke the wheel which instead killed her executioners. The palm branch she holds, often associated with martyrs, acknowledges her eventual death by beheading. Although this combination of figures would generally signal the popular “Marriage of St. Catherine” subject, the absence of a ring suggests another theme. This small but powerful and emotional engraving highlights some of the reasons Dürer is widely recognized as one of the greatest printmakers of the Renaissance period. He trained with his father and with Michael Wolgemut, whose workshop produced the Nuremberg Chronicles also seen in this exhibition. 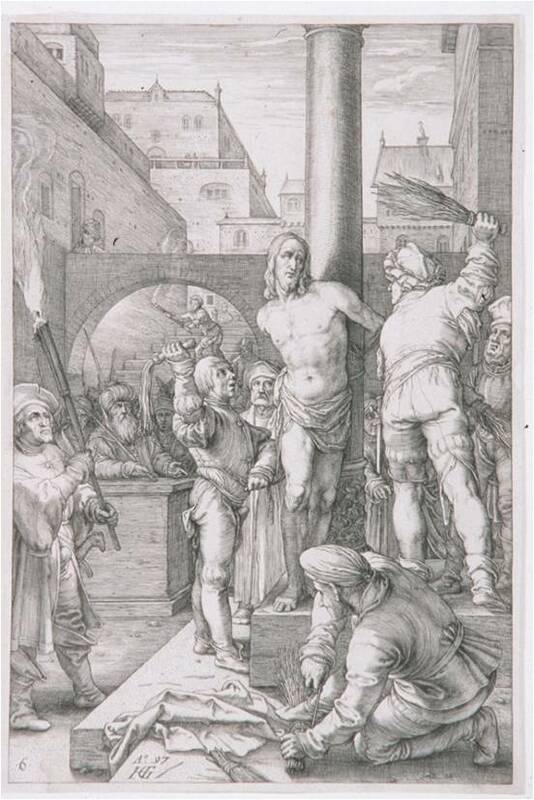 Dürer returned repeatedly in his prints to images of the Passion of Christ (the events leading up to and including Christ’s crucifixion, and including The Flagellation, seen in Goltzius’ print in this exhibition). In this particular image, the artist uses line, shading, poses, and gestures to stress the great grief of Christ’s disciples such as John the Evangelist (who stands to the right of the cross) and the female mourners clustered to the left which certainly include—according to tradition—the Virgin Mary and Mary Magdalene. The great influence of Dürer’s style on other northern European printmakers can be seen throughout this room. Through trips to Italy, Venice in particular, he also transformed and was transformed by art further south. Indeed, prints allowed Dürer to leave copies behind in Italy. This dissemination of his imagery played a central role in the artistic exchange between north and south. Heindrik Goltzius, a famous engraver of the late sixteenth and early seventeenth century, had the use of only one of his hands. In fact, Goltzius had long desired to travel to Italy. However, by the late sixteenth century when he finally undertook the journey, his fame had grown so much that he had to travel anonymously, being sure to cover his burned hand—a sure sign of his identity. His fame, however, was not derived from his disability, but rather his ability, and the ability of the engravers he trained to work in his style, to emulate and adapt styles of popular artists from his time. Those artists included Albrecht Dürer and Lucas van Leyden, both of whose work is also featured in this exhibition. The Flagellation is an early part of the Passion of Christ (told, like the story of the Good Samaritan to the left, in the New Testamant), which is the series of events in Christ’s life leading up to and including the Crucifixion. The Flagellation depicts Christ bound to a column as he is ridiculed, mocked, and crowned with thorns. 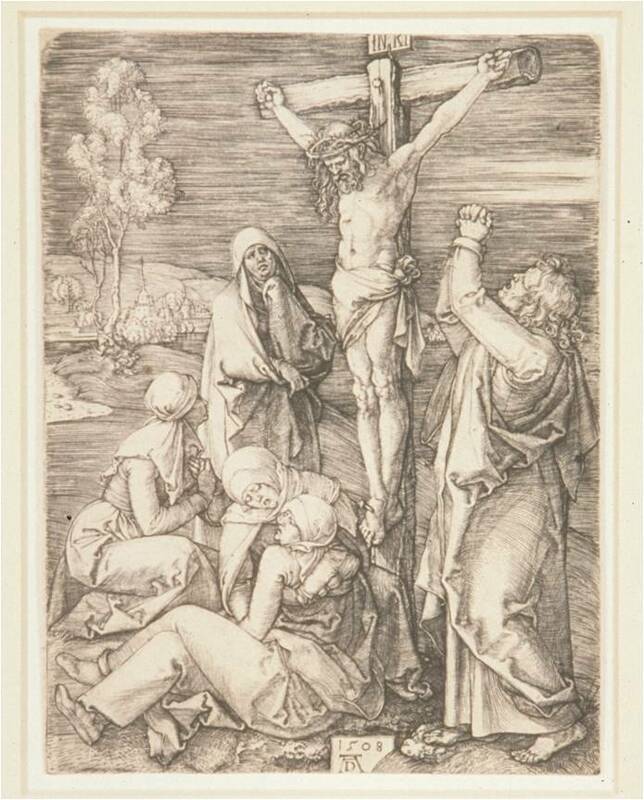 Goltzius illustrates Christ as mournful, yet accepting of his fate. The New Testament parable of the Good Samaritan from the Gospel of Luke (Chapter 10) clarifies that one’s neighborly kindness should extend to all peoples. In this engraving the artists have decided to illustrate a pivotal moment in the narrative. Here the robbed and badly injured Jewish traveler has been assumed dead and avoided for the sake of maintaining ritual cleanliness by the man’s “neighbors”, a priest and another Jewish man (both pictured in the background on the right). In the moment chosen, the man can be seen finally receiving aid from a Samaritan. This would have been particularly unusual to Jesus’ followers as Samaritans were a group generally avoided by the Jews in the time of Jesus. This story is sometimes recognized as an allegory for Christian salvation for which the Samaritan stands in for Christ and the injured man represents the sins of humankind. The bottom of the print includes a Latin inscription of the Biblical text which records this parable. 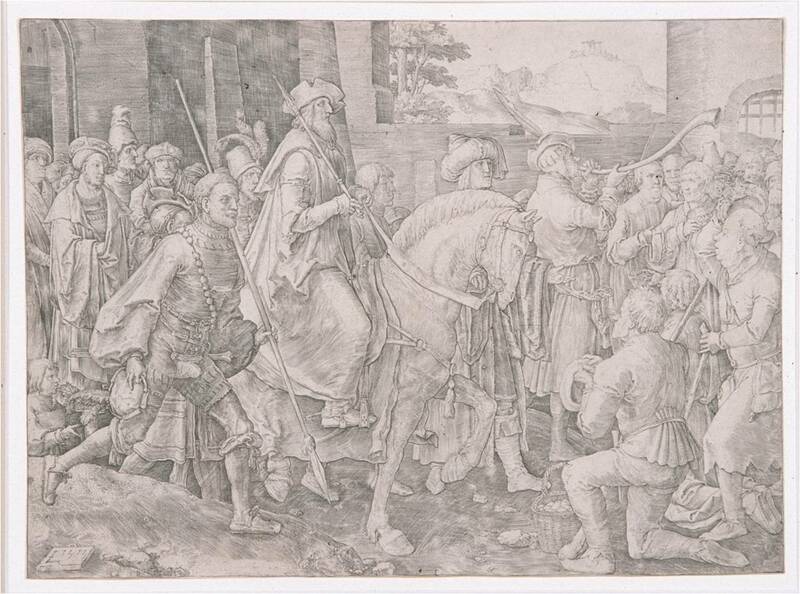 Although the figures in this engraving are dressed in Renaissance-era garb, the subject of this print by Lucas van Leyden comes from the Old Testament (as does the subject of the image of Joshua to the right). The story of the Jewish man Mordecai comes from the Biblical book of Esther which describes the events leading up to this procession, or triumph, of Mordecai. Previously, Mordecai, who was the adoptive father of Esther (the wife of King Ahasuerus), had exposed a murderous plot against the king. Although favored by the king thereafter, Mordecai himself was nearly killed by Haman (a Persian noble) after not showing Haman the respect he thought he was owed. In his rage Haman sent out an order to have all the Jews in the Persian Empire murdered. However, Esther successfully convinced her husband, the king, that the Jews should not be killed and that Haman instead should be executed. In the end Mordecai rides triumphantly across the city, the Jews were saved, and Haman can be seen faintly at the back of the composition hanging from the gallows he erected for Mordecai. In fact, the Jewish celebration of Purim commemorates this salvation of the Persian Jews following this triumph of Mordecai and is sometimes paired with Renaissance representations of Christian salvation. 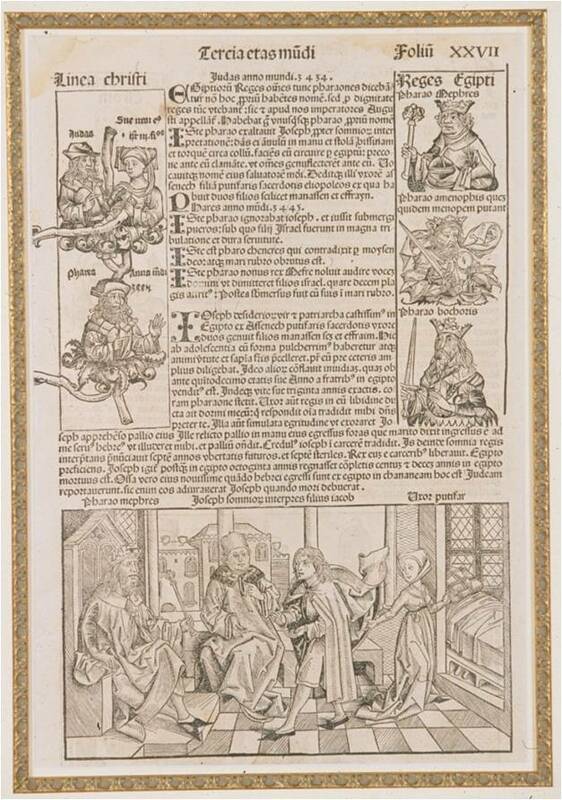 This page, cut from one of the original book editions of the Nuremberg Chronicle, shows images from what the Chronicle’s compiler categorized as the “Sixth Age of the Universe”, associated with the thirteenth century. It includes portraits and biographies of thirteenth-century popes Urban IV (reign 1261 – 1264) and Clement IV (reign 1265 – 1268) on the top right and of scholarly doctor Bernardus Compostellanus at the bottom right. The image of a historically significant comet (at the bottom right) represents the collaborators’ interest in documenting the implications of natural phenomenon for human lives. In this case, with the comet’s appearance (c. 1264) Pope Urban IV became deathly ill, and the comet mysteriously disappeared on the night he died. In creating the Chronicle book from which this page comes, Wolgemut and his workshop integrated text and image in a more sophisticated way than had been attempted prior to 1500. 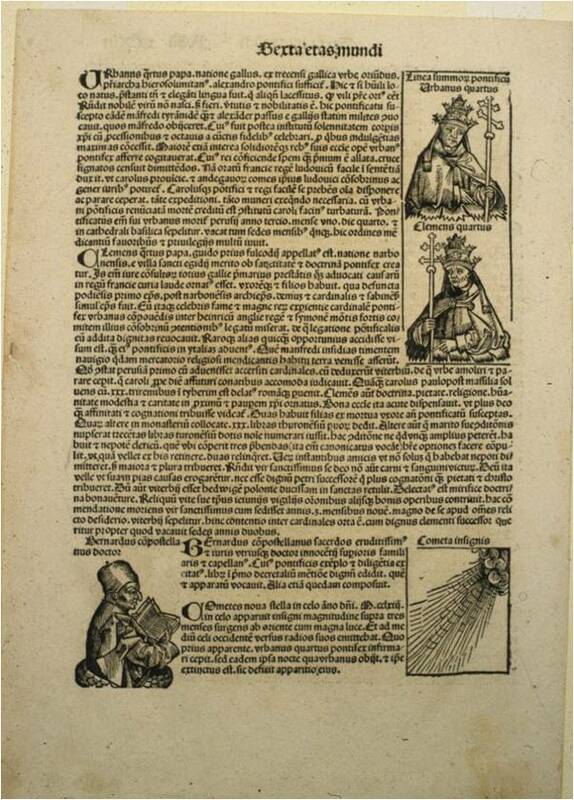 Michael Wolgemut, whose workshop produced the woodblock carvings of the Nuremberg Chronicle, presents here biblical images from what the Chronicle categorizes as the “Third Age of the Universe”, associated with ancient Egypt. A fragment of a genealogical table, continuing from the previous page, represents the Linea Christi or lineage of Christ (top left). The remaining images depict people and events from ancient Egypt. Portraits of “Reges Egipti” (pharaohs of Egypt, top right) include those of pharaohs Mephres, Amenophis, and Bochoris. At the bottom of the page, an elaborate wood carving fusing two Old Testament stories into a single scene shows, on the left side, Joseph, son of Jacob, interpreting the dreams of Pharaoh Mephres, and, on the right, Potiphar’s wife seducing Joseph. In the Chronicle people and places from biblical times resemble medieval European bishops and kings because, in order to save time and money, artists in Wolgemut’s workshop used the same woodblock carving multiple times to represent several people and places.